New addition to the HBO store the original True Blood beverage. 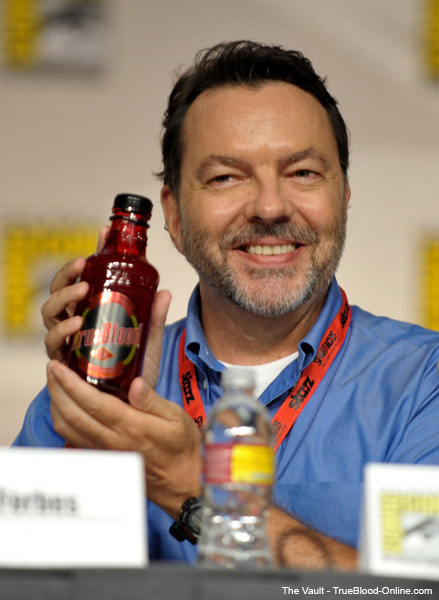 Be the first to own the Tru Blood Drink, ships early exclusively at the HBO Shop! Tru Blood ships in a 4 pack carton. You can pre-order it now, starting Monday July 28, there will be a 15% discount. 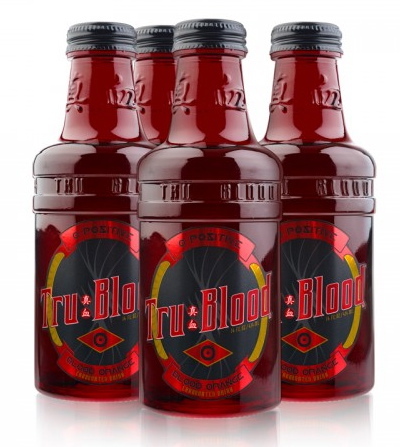 Meticulously crafted, the Tru Blood Drink is an exact replica of the bottle design as seen on True Blood. The 14oz glass Tru Blood bottle is stained in a rich red, with raised Tru Blood English lettering and matching Japanese Kanji. This blood orange flavored soda is slightly tart, lightly sweet and subtly carbonated. Designed to taste great while matching the appearance of Bill’s favorite drink, the drink pours like a regular soda, but with the standing appearance in a glass is stormy and mysterious. if only hbo delivers to australia…but they dont! Actually its available at Borders bookstore. I saw it the other day in Westfield. Oh really. Awesome. Which Westfield did you see it at? But is it available in diet????? now, don’t you be going all diet drink on us now mbb! you won’t get the same effect and you’ll go around biting everyone. Yes, they ship to Canada. A little vodka (right Gym?) and we’ve got a party! I preordered mine this morning! Thanks Lism…..hadn’t thought of adding a little vodka. It’s party time! Maybe I sould place another order. Is it suit for vegan? Any alcohol,animal ingredint or derivative? You should contact HBO Store about that. No, it’s not. The red coloring is insect-derived. Was at ComicCon and went to one of the HBO hosted parties were they gave away bottles and free drinks containing TruBlood. It is very tasty, but it’ll cost around $130US for me to ship a case to Canada – That is WAY to much. Was just trying to order some and the website says that it’s only available domestically!!! How do I get some up here in Canada??? Or am I reading the shipping information wrong? Is it going to be available in stores?? At the moment it is only available in the HBO store. Is it still not available in stores? Any ideas what stores will be carrying it?